When alive, he always sang “on the road again” and now he’ll sing “with joy I’ll carry on”, for in heaven “I’ll waltz with the angels”. He will be lovingly remembered by his wife Monique, his children Rachelle (Michael), Réjean (Elda) and Ginette (John); his grandchildren Desirée, Dallas, Katelyn, Blake, Tiana and Rafael. He will also be remembered by his siblings Armand (Lucille), Lila (Marcel), Joanne (Ken), Lucie (Leo), Tammy (Wes) and sister in-law Lynda as well as numerous brothers and sisters in-law and nieces and nephews. He was predeceased by his parents Roland and Della, his brother Conrad and 3 nephews. At the age of 10, Gilles’s love for music led him to learn how to play the guitar & the harmonica. As a young boy he spent many hours singing with his mom and his love for music grew to a life long passion. Their beautiful voices were enjoyed by many friends and family before she passed away in 1988. In his later years, he was the lead singer & rhythm guitar player in multiple bands and continued to play for family and friends anytime he had the chance. After 32 years of working at the Pine Falls Paper Mill, he retired at the age of 55 and added 2 furry friends to his family. Gilles loved going for walks along the St-Georges rivers’ walking trail with his wife Monique and their 2 little dogs. Gilles always loved nature and would spend hours tending to his yard and his gardens. He was always happy to see his flowers in full bloom and was always proud to tell anyone who asked what types of flowers were in his gardens. In 1999, Gilles made a record with a collaberation of 12 of his families favorite songs. One of which was his own personal favorite which was titled “Je Vous Envoie Des Roses Maman”. (In English this means – I offer you roses, my mother”). Gilles would sing this particular song to his mother and we know he’s up in heaven singing it to her now. 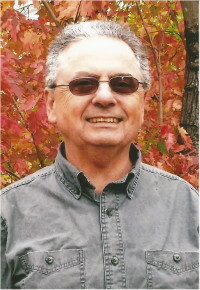 The family has posted many videos over the years onto YouTube under Gilles Boulet. The family wants to thank the excellent staff at Action Marguerite for all their love and kindness shown towards Monique and for tolerating Gilles’ mischievous shenanigans during his stay. Memorial Mass will be held at 1:00 p.m. on Saturday, March 23 at St. Georges Roman Catholic Church in St. Georges, MB with prayers at 12:30 p.m.
We are so sorry for your loss. He indeed loved to sing and we loved many of his songs particularly “je vous envoie des roses maman”. Our heart & prayers go out to you Monique and your family. Sincere condolences to all the Boulet family. We are traveling and cannot attend his funeral. We are sorry to hear of Gilles passing. Our sympathies are with your family. I will always remember Gilles playing in Four Wheel Drive. I am so saddened to hear of Gilles’ passing . Our sincerest condolences to the family. Our deepest condolences in the loss of your father, father-in-law, grandfather. husband. You are in our thoughts and prayers. Mes sympathies. Our thoughts are with you at this time of loss of your Dear loved one. He will never be forgotten. God Bless you Monique and Family. Love From Vic and Norma. My deepest condolences to Monique and the Boulet family. I will always remember his wonderful sense of humour and Gilles playing his guitar at Midnight Mass. He will be missed. May he rest in peace.